The Ardelia Trio is a dynamic presence on the international chamber music scene. Forged by a common commitment to presenting innovative and engaging interactive concerts, Janey Choi (violinist), Clara Yang (cellist), and Jihea Hong-Park (pianist), formed the group after working together in various capacities as performing and teaching artists. In their inaugural year, they were awarded a prestigious grant to partner with arts organization, Mécénat, and establish a community concert residency in Seoul, South Korea. In 2009, they were selected for the highly coveted opportunity to present a workshop at the 53rd Annual National Conference of the College Music Society. Highlights of the past season include debuts at Carnegie’s Weill Hall and the Bar Harbor Music Festival. While comfortable in the traditional concert setting, the Ardelia Trio also thrives on going beyond the formal stage, bridging the gap between performers and audience. The breadth of their repertoire ranges from the Baroque through to commissioned works by today’s living composers. The trio aims to create a personal experience for each audience member, from the youngest of listeners, to the most seasoned concert-goer, tailoring to a wide range of performance settings. As Teaching Artists, they have continued to reach out into the community with residencies and interactive concerts in New York, Central America, Japan, Korea and the United Arab Emirates; sponsored by the New York Philharmonic, and grants from The Juilliard School, the Piatigorsky Foundation, and the Kumho Asiana Cultural Foundation. Each member brings a wealth of performing experience to the group, having performed internationally in such venues as Carnegie Hall, Lincoln Center, the United Nations General Assembly Hall (NY), the Kennedy Center (Washington, D.C.), Tanglewood Music Center, Banff Centre for the Arts (Canada), Royal Albert Hall (London), Yun Isang Concert Hall (Korea), the Spoleto Festival (Italy), Niigata Performing Arts Center and Komae Ecorma Hall (Japan). They are based in New York City where the have held teaching positions at The Juilliard School, the New York Philharmonic, Chamber Music Society of Lincoln Center, Binghamton University, Queens College, and the Mozart Academy at John Jay College. 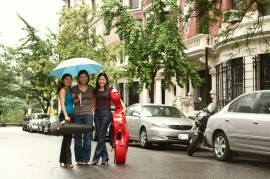 The trio members each hold BM and MM degrees from The Juilliard School. Ms. Hong-Park and Ms. Yang are currently pursuing doctoral degrees at Teachers College, Columbia University, and Rice University, respectively. Dr. Choi received her DMA from Rutgers University.